Choosing a tripod can be a daunting task. With so many variables to consider – gear you already have, travel limitations, performance needs, desired features, budget, future gear purchases – it’s easy to feel overwhelmed. In this series of posts, we’ll cover some guidelines and decisions that a photographer will use to select the best possible tripod for their needs. What do we mean when we say “support”? In basic terms we mean holding up the camera in a safe/balanced position that is free-standing and secure. This means having a tripod and head that can physically withstand the weight of the gear on top. Leg hinge joints, twist locks for telescoping sections, and material strength come heavily into play in providing that basic support. These discrete weights are easy enough to measure and test, and we rate our tripods conservatively according to what the average user can expect to easily gain. Joe swings from our TQC-14 during a demonstration, proving the 25lb load capacity is conservative. However, there is also another unseen side to supporting a camera: the realm of vibration. In the world of hand-held shooting, the concern is “camera shake” and the threshold for sharpness related to shutter speed. 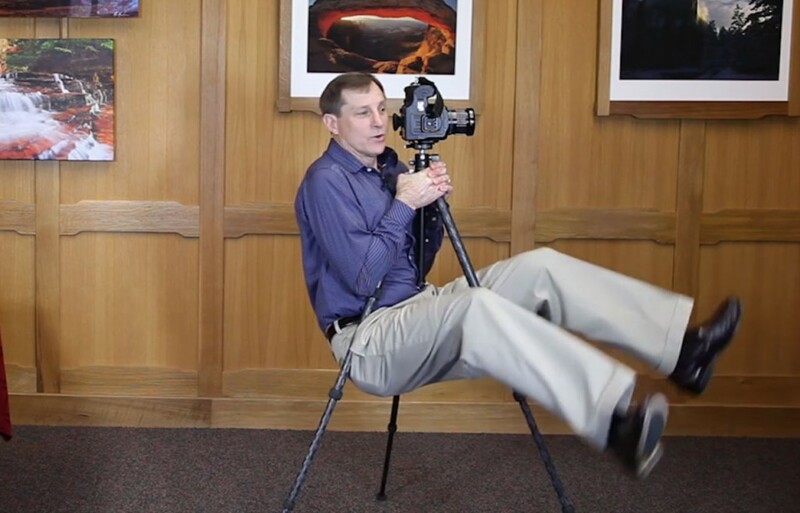 In tripod-mounted photography the camera is stationary, and it’s the job of the tripod and other support components to absorb and dissipate vibration. This vibration can come from within the camera itself (shutter/mirror reflex), or from external forces such as wind. A true support will not only be rigid, free-standing and load-bearing, but should also dampen enough vibration to allow the camera and lens to resolve fine detail at their maximum clarity and sharpness. This is a primary concern for any serious image maker, but is often overlooked in entry-level support gear in favor of flashy features and functions. It’s our core belief that any worthwhile tripod should be, above all else, an outstanding performer in this area. When Joe Johnson and the Really Right Stuff engineering team set out to design the first Really Right Stuff tripod, they took cues from the aerospace and racing industries in the selection of the best possible carbon-fiber. What they came up with is a tube that is a larger diameter than usual, but with a wall thickness of only 0.04 inches. As a result of this material selection and the “big and thin” design principle, the tubes remain extremely lightweight but are far more rigid and durable than the competition, allowing for higher load ratings within a given class. This “big and thin” design also contributes to the superior vibration damping capability of our tripods across the entire spectrum of noticeable vibration frequencies. When it comes to selecting a tripod, it’s important to have a means of comparison for the performance and support each can offer. On one hand, this is a simple measurable value – how much weight can the tripod hold up safely without collapsing or failing in some way. But the unseen vibration damping performance is difficult to quantify itself, so we must use other means of comparison. By separating the tripods into size “class” groups, we can use the focal length of the lens as a guideline to make sure a tripod can adequately dampen vibration to allow that lens to resolve detail at full power. Within the Really Right Stuff tripod line, there are three size classes or “Series”: Versa 3, Versa 2, and Series 1 Quick-Column. 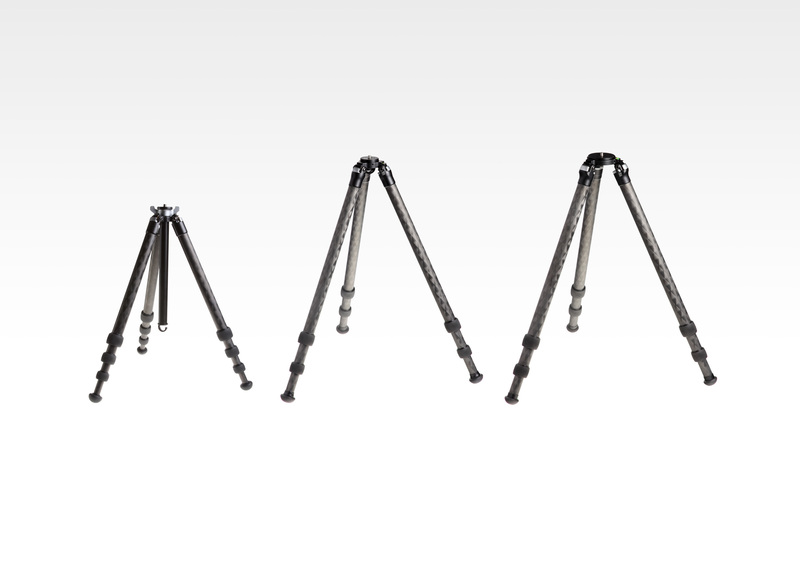 Tripods within each Series share the same basic size and construction, and vary only in the number of leg sections and the length of each section, giving various options for extended and collapsed (packed) dimensions. Because of the identical construction, each class carries the same numerical “load capacity”, rated anywhere from 25 to 50lbs. Most photographers, however, are using gear that weighs much less than those ratings. Technically the smallest tripod, our TQC-14, could hold a 500 or 600mm lens without collapsing. So why don’t we recommend that combination? It all comes back to vibration. The longer the focal length, the more vibration can be apparent (thanks to the magnification of the lens and variables of longer optics), and therefore the higher the demands for eliminating or preventing that vibration. Based on this principle we focus more on results-driven comparison based on the gear that will be supported. Having a load capacity much higher than the weight of the gear gives additional capacity to be used for additional ballast or weight to be mounted on the tripod, which helps with both balance and inertia (preventing vibration). What this means is that we can come up with easy-to-follow guidelines for each tripod class, based on the largest/longest focal length lens it will offer “true support” for. Below is a table that breaks down Really Right Stuff tripods by class and rated/recommended capacities. We base these focal-length limits on practical testing and the resolution demands of professional-grade digital sensor technology. *Note that the focal lengths listed are independent of physical weight or lens speed (aperture). This means that even though a 300mm/f4 lens might weigh only about as much as a 70-200mm/f2.8, you still have the same magnification factor to deal with in terms of “revealing” vibration within the system. This may be emphasized by the lower mass of the lens as well, since a lighter setup has less overall inertia (resistance to outside vibration). Adding tripod ballast by hanging weight from the built-in hook helps offset that difference. In many cases this logic applies in the other direction as well. The 400mm/f2.8 series Nikon or Canon lenses are a perfect example of this. While a 400mm magnification factor can be handled by a Versa 2 tripod (especially with added weight on the tripod), the sheer weight and bulk of a lens that size may be easier to handle, and therefore safer, on the broader and more rigid Versa 3 platform system. Since lenses of that size inevitably require full-sized ballheads or gimbals, the Versa 3 tripods also present a better ergonomic match in most cases. Gaining the best performance possible for supporting your gear is all about choosing the right tripod class or size, but that’s only the first step. Once you know what tripod class can best support your camera and lenses, you may still have a few options to choose from. The choice of a particular model within each class enables you to have a tripod that can get as tall as you need, or collapse small enough to join you in even the most restrictive travel situations. In the next sections, we’ll cover the considerations for narrowing down the choices, and compare some key specs within the Really Right Stuff tripod line. Since m4/3 cameras have significantly lighter bodies and lenses, do the same rules on 35 mm equivalent focal lengths apply? I’m more concerned with the tripod head than the tripod itself. For instance gibal versus ball.